Koelreuteria paniculata (Golden Rain Tree) also known as Pride of India has graced the Summer garden for many years. In spring the leaves are pinkish, turning a wonderful glowing yellow/orange in autumn. The high winds this winter proved a little too much and lead to the trunk being sheared off at it’s base. It is a sad loss and I’m sure our regular and local visitors will miss the fabulous colour and spectacle it provided to this part of our gardens. 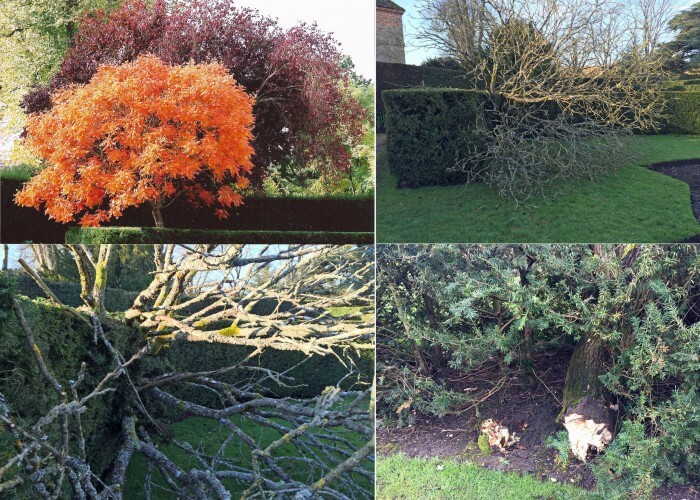 Although there is damage to the Yew hedge as you can see in the bottom left image, this will quickly grow back and fill in over the course of the coming season. Koelreuteria paniculata (Golden Rain Tree). Native to Eastern Asia and China. Before and after the sad event.